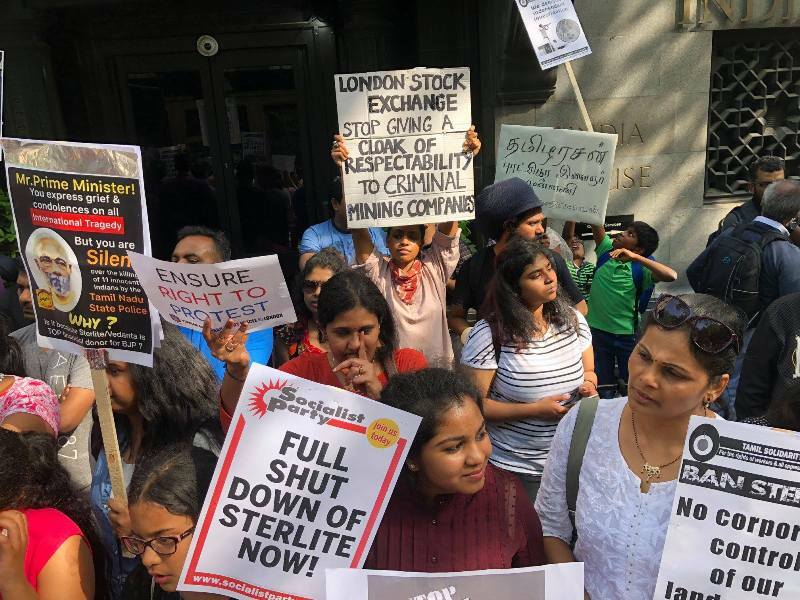 An angry protest took place yesterday (26th May) from 3-5pm at the Indian High Commission in Aldwych, London, to condemn the police firing which killed at least 13 unarmed protesters at an environmental demonstration against British company Vedanta Resources’ copper smelter in Thoothukudi (Tuticorin), Tamil Nadu on Tuesday. The London protest was called by Foil Vedanta (1), Tamil People in UK, Periyar Ambedkar Study Circle, South Asia Solidarity Group, Tamil Solidarity, Parai Voice of Freedom and Veera Tamilar Munnani. 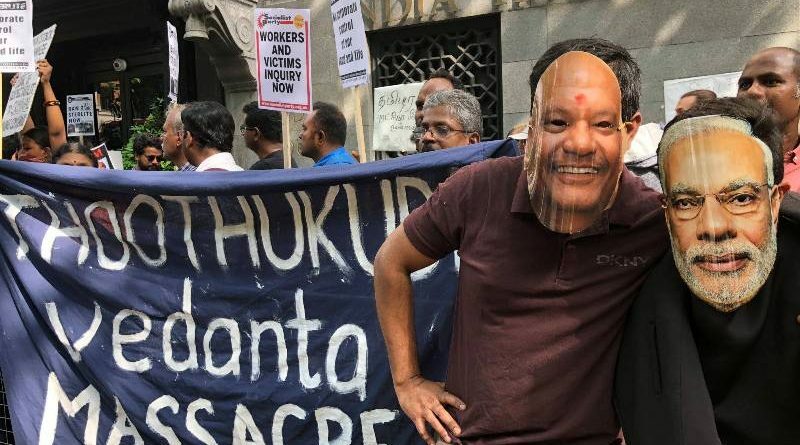 The protests in London, a day after an entire statewide bandh (shutdown of businesses and services) in Tamil Nadu, and parallel global protests condemn the Tamil Nadu state government’s collusion in this corporate massacre. 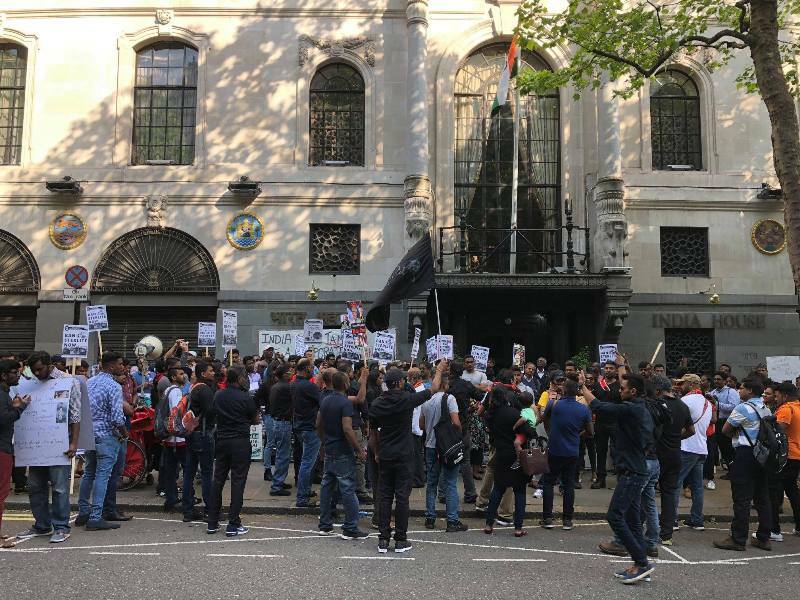 A large and noisy protest dominated by traditional Parai drummers was held at the India High Commission in London on 23rd May following the Thoothukudi Vedanta Massacre. 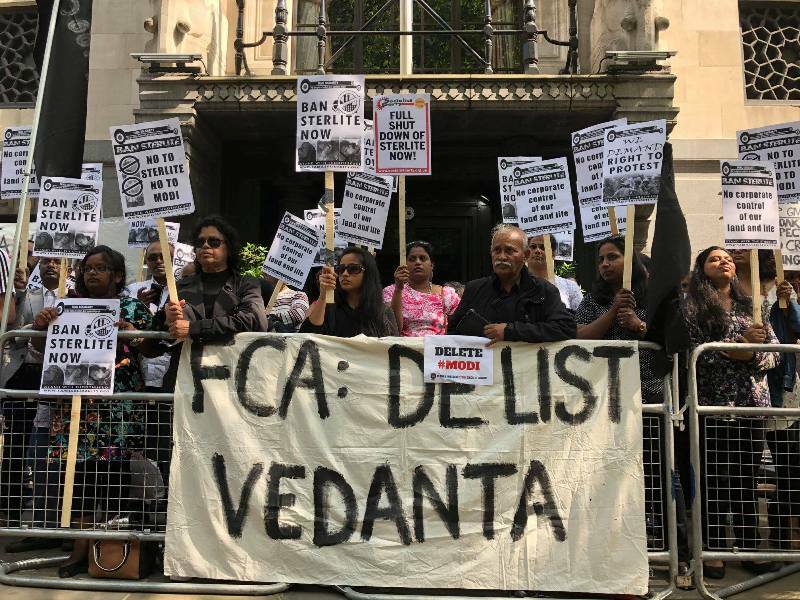 We call on the British government to launch an inquiry into the multiple legal, environmental and human rights violations by Vedanta Resources, and consider de-listing the company from the London Stock Exchange. In India the authorities have now resorted to blocking the internet in Thoothukudi and the neighbouring districts of Tirunelveli and Kanyakumari for five days until May 27. Arbitrary arrests and house to house arrests continue in Tuticorin under a heavy security clampdown with the free flow of information heavily curtailed. Even accusations of state terrorism are rife (2). 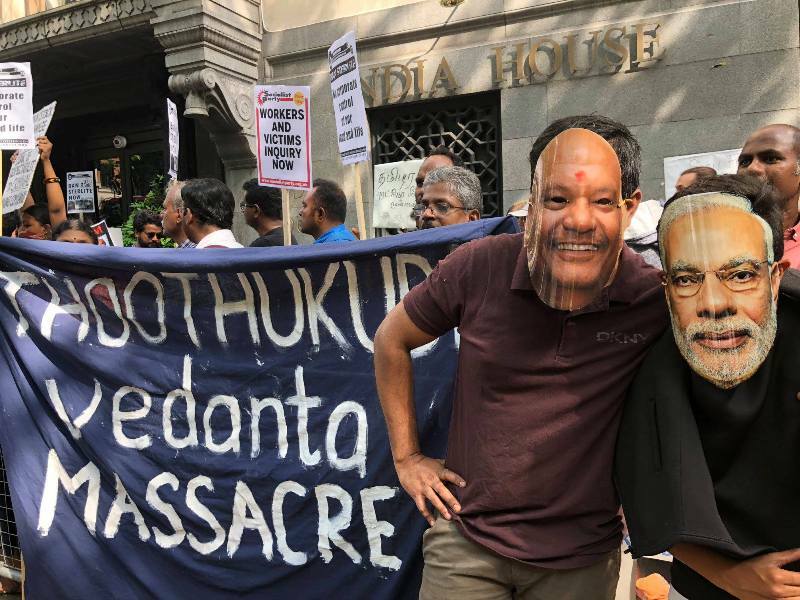 On 22nd May tens of thousands of people democratically organised and thronged the streets of Tuticorin for the 100th consecutive day of protest against Vedanta subsidiary Sterlite’s copper smelter. 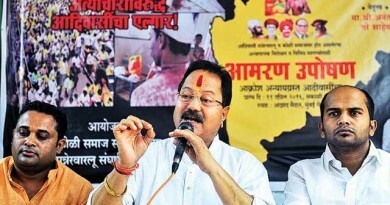 The protest, as it was being organised was targeted by 17th May by Vedanta requesting the High Court to invoke the draconian Section 144, a curfew order against ‘Unlawful Assembly’. Vedanta’s request was to cover up to one kilometre around the smelter as a ‘no protest zone’ . The top district administrator, District Collector N. Venkatesh imposed Section 144 as the protest decided to march on the Collectorate to demand answers and action. When the rally reached the Collector’s office, police opened fire killing several protestors. Exact details of events especially as to who gave the order to shoot to kill remain unaddressed and there are now strong local demands seeking justice. The Section 144 is being abused even now to prevent legal support for victims. British company Vedanta Resources’ subsidiary Sterlite Copper has begun construction of a new 4 million tonne/year smelter on the edge of the town of Tuticorin, almost doubling their capacity, but residents argue the existing smelter has continuously polluted their water and air since it was established in 1996, causing respiratory and skin problems, fainting and other illness, especially among children. 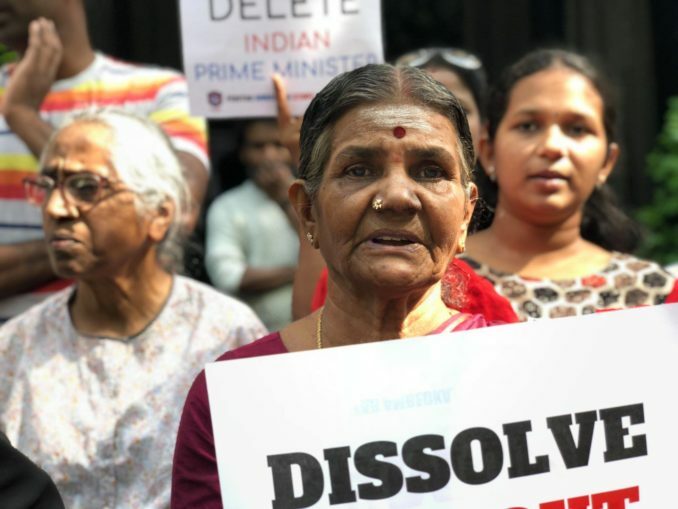 Activists also claim that Sterlite obtained its Environmental Clearance illegally by falsifying information to statutory authorities, while the existing plant is regularly found to be dumping toxic waste in the town, and operating without proper licenses (3). The plant releases its waste into the sensitive Gulf of Mannar Biosphere Reserve, an area of coral reefs and mangrove forests. Vedanta’s only other copper smelter in Chingola, Zambia, is the subject of a precedent UK damages case on behalf of 2000 farmers who have been polluted by the plant since 2004. Sterlite was the first company set up by British Indian billionaire Anil Agarwal in India before he launched Vedanta Resources on the London Stock Exchange in 2003, where it is now a multi-national FTSE 250 company with operations across India and Africa. The company even had operations in military-ruled Myanmar in the 1990s (4). Vedanta, which was named the ‘world’s most hated company’ by the Independent newspaper in 2010, has received considerable support from the British government, including the direct assistance of former Prime Minister David Cameron in buying out Indian oil company Cairn India in 2011. 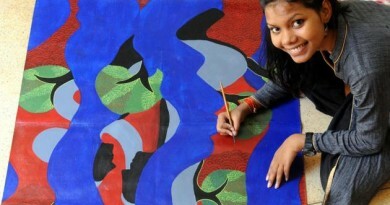 Case studies in Tamil Nadu are available. http://www.bbc.co.uk/news/world-asia-india-44207343 for a 22 May report on the massacre of protesters. Most gruesome of the shootings were carried out by police snipers deployed a considerable distance from the confrontation between protesters and police outside the Collector’s office. The sniper fire was without any warning, fuelling accusations that the killings were pre-meditated. As spontaneous violent reactions  erupted live rounds were fired into unarmed crowds in multiple locations around the city. 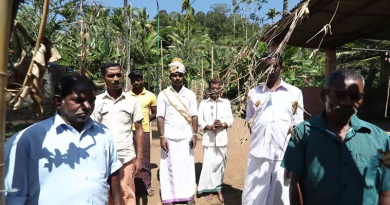 The massacre continued later in the evening, as police opened fire again at Threspuram, a fisher village, whose residents were spearheading protests in the evening. Relatives were violently prevented from accessing the hospital where the dead and injured had been taken, there are even reports of many injured fearing to seek medical help in hospital. A covert oppression had started the night before with arrests and intimidation of community activists and leaders. The oppression continued through Wednesday 23 May with a brutal killing of a protester. The numbers of dead are expected to rise in coming days. A new Collector and new police chief have been appointed for Thoothukudi district, little else is known of the security clampdown. In 2013 The Supreme Court of India found Sterlite guilty of operating without various permissions since 2003. In September 2017 the National Green Tribunal (NGT) issued a judgment, following the show cause notice they had issued to Sterlite in March 2017 for several instances of toxic waste dumping and pollution as well as operating the smelter above its consented capacity. Many tonnes of copper slag were found dumped in the Upper Odai river, which Sterlite claimed they had sold to a developer for levelling of a construction site. The Upper Odai stream was also blocked with toxic copper slag causing a ‘manmade disaster’. Sterlite Gold was one of the first companies to obtain exploration rights when Myanmar’s mining regulations were modified to allow foreign companies to hold and develop mines. They explored and developed several gold and copper mines but terminated their joint venture with the Myanmar Ministry of Mines in 2005. 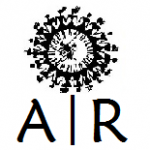 Editorial Team of Adivasi Resurgence.